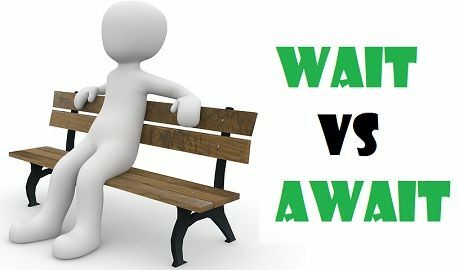 The words ‘wait’ and ‘await’ are quite identical in their meaning and seem synonymous, but one should not use them interchangeably. This is so because ‘await’ is more formal, as compared to ‘wait’. ‘Wait‘ means to pass the time until an anticipated event occurs, whereas ‘await‘ means to wait for something with a hope. The Principal was waiting for the Chief guest to arrive, but the Chief guest was awaiting the call. In these two examples, you might have observed, that the word wait is used in the context of repose, pause or delay, whereas await is used when someone/something is waiting with anticipation. Meaning Wait means to stay at a particular point/place, till a specific time goes by or event occurs. Await means to wait for something to happen with an expectation. Example We waited patiently for the doctor to arrive. We are awaiting their response on the matter. Arnav waited for 3 hours for the train. That was the most awaited trip. The audience can't wait for your next video. Jimmy is awaiting the joining letter. You’ll to wait until the results are announced. Wait here till she comes back. I was waiting for my friend on the road when Harry passed by. My parents were eagerly waiting to see me after five years. After a long wait for the officer, I finally get the approval. The meeting will have to wait. Your parcel is waiting at the post office. Further, to stop or interrupt someone, while they are doing or speaking something, we can also use wait in expressions like wait a moment, or wait for a while. This is just to say the person to take a pause, for some time. My parents are eagerly awaiting my UPSC results. Finally, the most awaited movie of the year is going to be released. The couple was awaiting their first child’s birth. The bill was awaiting the President’s approval. The deal is awaiting signature. A beautiful surprise awaits David. While ‘wait’ can be used as a noun or as a verb in a sentence, await can be used as a verb only. ‘Wait’ is an intransitive verb, as it can exist even without a direct object. On the other hand, the word ‘await’ is a transitive verb which requires a direct object, which is commonly an abstract noun. Usually, a preposition follows the word ‘wait’ whenever there is an object. As against, no preposition follows ‘await’, because, the word itself means ‘wait for’ and if we use any preposition after it, that will not make any sense. Simon has been waiting there for two hours. Do you think I must wait? The victim is awaiting judgement. Robin is still awaiting the results. A new beginning of your life awaits you. The only difference between wait and await lies in their meaning, wherein ‘Wait’ means to stay inactive or in resting mode, and not do anything further, till something which you are hoping to take place, happens finally. On the other hand, when you are waiting for something to happen with expectation, we use the word ‘await’. Your site is amazing. I like your thinks.